Opening with one of their best numbers, ‘Al Dente’ is aptly named considering it’s quite hard, but with a spiky riff amped to the max, it also has a tune that’s got a lot of guts. Centring around a semi-muted chug, extra guitar parts lay on a defiantly 90s grungy distortion, while a semi-distorted vocal comes across with an obvious Thurston Moore influence. Once all the pieces fit, Evil Owl take the roots of garage rock and drive them into a garage-grunge frenzy that wins out through a deceptive simplicity. If you like the louder end of Mudhoney, Sonic Youth or Tad, there’s something here with which you’ll identify immediately and then love after just two or three plays. Stretching out to twice the length and adding extra grubbiness, ‘Tantrum’ opens with an ominous riff and echoing vocal before a brilliant sludge sludgebeast of a riff swamps the space where a chorus should be. Returning to the verse arrangement, the garage rock elements are augmented by extra guitars and the vocal really comes into its own, but if anything makes this tune a potential DIY classic, it’s the second appearance of the heavy riff joined by a wordless howl. For an instrumental break, the heaviness is contrasted by arty discords straight from the most commercially successful period of Sonic Youth and, although brief, this provides one of the EP’s best moments. Finishing with the heavier riff and a howling rage of a vocal that sounds like Mark Arm channelling the worst fury ever, this track shows off Evil Owl’s 90s influences brilliantly. Proving they also have an ability to offer something quieter – at least at first – the instrumental workout ‘Bear Suit’ opens with a heady blend of 90s alt-rock and blues sounds, presenting a very pleasing clean guitar tone over the main riff. As the repetitious tune progresses, the volume increases and after a couple of minutes, the band’s beloved distortion plays a major role, beefing up the riff and creating some a pretty thrilling blues-grunge hybrid, before tailing off with another clear Sonic Youth-ism. Finally, ‘Love Rat’ kicks off with grumbling bass and the kind of grunge-edged garage rock riff that provided the real muscle of Tad’s ‘8 Way Santa’ album. The fusion of distorted vocals, chugging riffs and fuzzed up leads results in one of the finest examples of the style, before the band decide to switch to a slower and slightly heavier mood – something that on its second appearance gives the track a very solid ending before everything trails off into distortion. 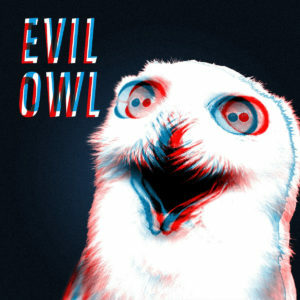 As before, there’s very little here you won’t have heard before, but Evil Owl do it exceptionally well. This is an absolute corker of an EP. Its four songs are at once dirty, ugly and rough, but each one is laden with so many fat and distorted riffs that it’s hard not to sit up and take notice. If you’ve ever had anything like a passing interest in Sonic Youth, Superchunk, Girls Against Boys and/or Tad (and especially Tad), this short release is a must hear. This entry was posted in Album & EP Reviews and tagged alternative, bristol, evil owl, fuzz, stream by Real Gone. Bookmark the permalink.